A team of researchers with the RIKEN Center for Life Science Technologies and the National Agriculture and Food Research Organization, both in Japan, has found a way to alter silkworm genes to create silk with useful proteins. In their paper published in ACS Synthetic Biology, the group describes their technique and suggest possible uses for it. For many years scientists have strived to improve on the already impressive attributes of silk—some would like to make it stronger, others to produce silk naturally in different colors, while others yet would like to include features such as antibiotic properties. Such efforts have not always been as fruitful as desired, however; thus, research continues. In this new effort, the researchers sought to change the makeup of silk by causing the silkworm to produce and use unnatural proteins. The researchers sought to induce silkworms to produce an amino acid called 4-azido-L-phenylalanine, which the worms would add to the silk they made. The researchers used tRNA synthetase to get their silk-producing organs to create azidophenylalanine and then to accept it as an added ingredient in silk production. They then used a bacterial screening system to weed out the cells that were not receptive to adding the protein as silk was spun. This was followed by the creation of four altered silkworm strains and adding the genes responsible for causing the creation of azidophenylalanine in only the parts of the worm involved in creating the materials for use in spinning silk—allowing it to make its way to other body parts could have led to undesired side-effects. At this point, the team was ready to test their work by allowing the genetically modified worms to spin some silk. Testing of the silk showed that for two of the strains, more than 6 percent of the natural enzyme had been replaced by azidophenylalanine—proof that their technique had worked. 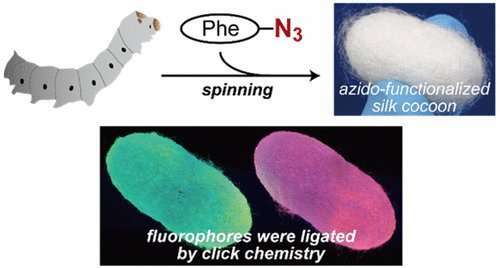 The team then demonstrated that adding a protein such as azidophenylalanine could provide a positive function by conjugating the silk produced by the modified silkworms to fluorescent molecules through the use of click chemistry, which caused the cocoons to glow—one bright red, the other green. The genetic code in bacteria and animal cells has been expanded to incorporate novel amino acids into proteins. Recent efforts have enabled genetic code expansion in nematodes, flies, and mice, whereas such engineering is rare with industrially useful animals. In the present study, we engineered the silkworm Bombyx mori to synthesize silk fiber functionalized with azidophenylalanine. For this purpose, we developed a bacterial system to screen for B. mori phenylalanyl-tRNA synthetases with altered amino-acid specificity. We created four transgenic B. mori lines expressing the selected synthetase variants in silk glands, and found that two of them supported the efficient in vivo incorporation of azidophenylalanine into silk fiber. The obtained silk was bio-orthogonally reactive with fluorescent molecules. The results showed that genetic code expansion in an industrial animal can be facilitated by prior bacterial selection, to accelerate the development of silk fiber with novel properties.